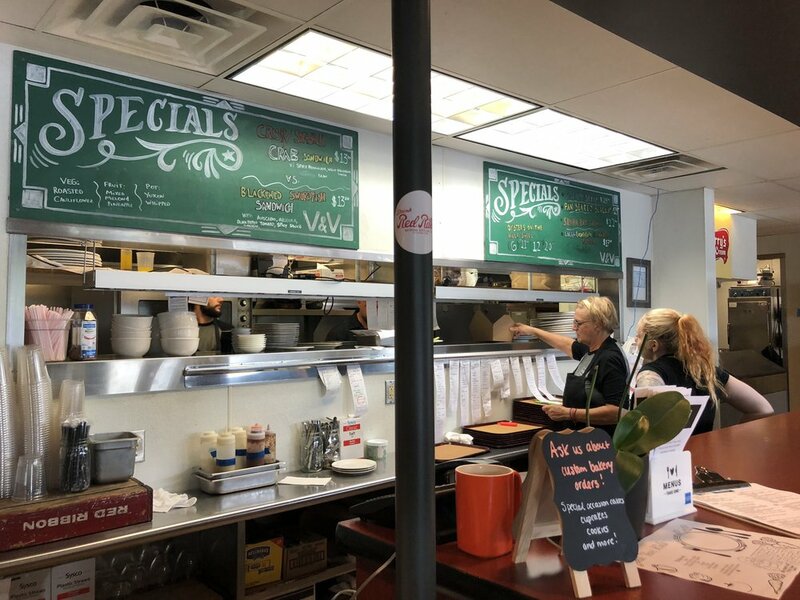 V&V Scratch Kitchen Opens in Finleyville and Try the Wings! In Finleyville there isn't too much to see and do; a short drive away is Trax Farm and Mineral Beach, but mostly it is farmed. However in this small town just outside of Pittsburgh there is a new scratch kitchen where the line is out the door. V&V Scratch Kitchen just opened an already word is spreading about the amazing food. V&V Scratch Kitchen starts with a large chalkboard filled with daily specials and an ice cream list that will make any kid scream. There is plenty of seating including a few outdoor tables along the sidewalk. When you walk in it is order at the counter and receive a number. The food is then brought to your table, including dessert and drinks. There are specials that are daily or until they run out. All of the meat is smoked in a smoker outside in the parking lot. Everything I ate was smoked in one way or another. The wings, bacon and even the burger was smoked. Let us start with the drinks. Lemonade and Iced Tea was homemade/fresh squeezed. There is soda for purchase in glass bottles. V&V Scratch Kitchen is BYOB; it is not listed on their site, however, halfway through dinner some patrons had 6-packs brought in from presumably Trax Farm. Appetizers are plentiful and I had a plateful of Calamari. Calamari was crispy and flavorful and served with a sweet Thai chili sauce. Dinner consisted of twelve wings with garlic parmesan flavor smoked to a crisp. Partnered with a three cheese mac & cheese it was perfect. My dinner partner enjoyed homemade pirogies and a double cheeseburger with bacon. The potato chips on the side of the burger are handmade kettle chips. We didn't stay for dessert (I was quite full), however, there is baked goods and Perry’s Ice Cream. Also noted was brunch is served on Sunday from 11-3. Brunch items include Belgian Waffles, Crab Cakes Eggs Benedict and Eggs, Steak and Cheese Sandwich. V&V Scratch Kitchen is located at 6108 Brownsville Road Ext., Finleyville, PA 15332. For more information visit https://vandvkitchen.com. Want to know about Trax Farm? Check out our visit there: Trax Farm.